Your hunt is not complete until you have the meat to take home to your family and friends! 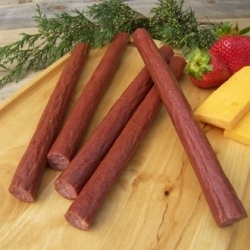 Zeb smokes items such as snack sticks, jerky, summer sausage, brats, ring bologna, and more! 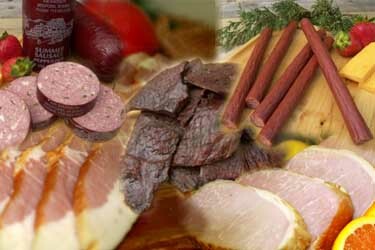 Zeb's Smokehouse will individualize your order and then contact you when it is ready to take home to enjoy! We also can ship your order to you! All of his products are top notch and something you will be proud to share with others! Below you will find a price sheet as well as recommendations on caring for your harvest. We would like to wish you all safe and happy hunting! Please leave the hide on, this helps protect the meat and keep it clean. An extra charge will be applied to skinned deer. If you would like to skin it we would recommend seeing deboning instructions below and completing the deboning prior to bringing in meat. *Please see notes below on skinning and deboning meat. We want it to come in grinder ready to our standards. We would like meat in 5” or smaller chunks, red meat only, with all fat and connective tissue removed, placed in gallon ziplock bags. If it needs trimmed or cut down there will be a charge to cover our labor in doing so. We do reserve the right to refuse meat. Processing price per pound of pre-smoked weight. It does not include to added beef/pork price. Items with added beef and pork or noted below. Deer need to be brought in field dressed with the hide on with proper tags attached. Wash out the inside of the carcass and remove all hair and blood. This will also help cool the meat. Put bags of ice in chest cavity and between hind legs to cool carcass when weather is warm. If fresh, bring it in as soon as possible. Prop deer legs and cavity open to cool (if below 40 degrees) or ice down. (Ensure the legs are going to stay propped open). If this is not done, the meat may spoil. Zeb takes great pride in the products he produces at the smokehouse, and this can only occur with meat that is clean and trimmed of all fat. Every customer deserves to have only the best meat in his/her products. Zeb's team goes through all trim that is brought into the smokehouse thoroughly. After skinning the deer use a propane torch and graze the meat with the flame. This will snap any hairs that are remaining on the meat. Rinse the meat with water to remove the remaining debris. Ensure you are deboning your deer in a clean area. Ensure all fat is trimmed from the meat. Any white should be removed or our team will be removing. Meat should be bright red. Use your nose. If it doesn't smell like good fresh met, trim it off and dispose of it. Keep it clean after trimmed. Bringing meat in gallon Ziploc bags is a great way to ensure trim stays clean and any cleaning fees can be avoided. DO NOT soak deer meat in water. Freeze the meat right away or bring fresh trim in within 2 days. If you feel this is a lot to manage bring your deer field dressed and we will take care of the work for you!! Steaks and roasts will be from your own deer. All trim brought in is thoroughly inspected. An extra fee will apply if we have to remove bone, hair or excess fat. Meat will be refused if it is not properly cared for. Thank you for understanding, and we hope this gives you reassurance that all meat you are getting in return is only of the highest quality! Zeb's Smokehouse also participates in the Iowa Hush Program.